Few people can imagine the utter devastation that results in losing a child. 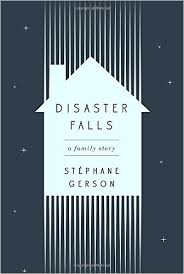 The author Stephane Gerson chronicles the life of his family following the death of his son Owen in the book Disaster Falls. Owen was just 8 years old when he traveled from his home in New York to Utah with his parents and older brother Julian. The mother of the family, Alison, was attending a work meeting there, and the rest of the family decided to come along and make a vacation out of the trip. Friends had recommended the rafting adventure down the Green River. A group of 24 adults, children and guides started out on the rafting trip. When the group assembled at a meeting point after the first day of rafting, Owen was not there. While his parents searched frantically for him, a guide took a kayak and traced their route back where she found Owen's lifeless body. Although a helicopter had been called in for search and rescue, it carried so much equipment that there was no room for passengers. Because they were at such a remote spot, the only option was to carry on with the original plan: to camp overnight and raft out the next morning. The first part of the book deals with the first year following the accident. The family dealt with the loss in different ways. Stephane, the father, was beset by guilt and lethargy. His wife became restless and walked constantly. Their son, Julian, was troubled by losing his brother, but also by having to witness his parents' grief and anguish. The family is constantly comforted by learning new things about Owen as friends and classmates relate stories that they'd never heard before. Stephane was also frequently told about losses that others had suffered, which he interpreted as a way for the speakers to unburden themselves. He also learns more about Disaster Falls, including the many mishaps that have occurred there throughout history and how it got its name. After the accident, Stephane was dismayed that he hadn't taken more time to learn about the area where he would be taking his family. Later on in the book, he goes to his family's ancestral homeland, Belarus, with his father (whose parents had immigrated to the US in the 1920s). Although his 80 year old father had never visited Belarus, this trip served to draw them closer together as they reflected on roots and loss. The final section of the book, End Stories, deals with the family's lawsuit against the rafting company that conducted the trip they were on when Owen died. The family had been upset that the dangers of the rafting trip were minimized, that the company's representatives were not fully trained or able to handle a possible death and that there was little communication about what was going on during and after the rescue operation. This is such a horrible scenario. Of course there's no easy way to deal with the death of a child, but being forced to remain in an isolated area and wait to inform family and friends of the loss is especially heartbreaking. At the same time, there were some strange things that caught my attention. First, it was odd that the family saw nothing strange in sending a young child with no rafting experience alone along a very dangerous stretch of water, and that there was no research by the parents about this area before they went. There was another strange incident mentioned. Apparently Owen was invited to a sleepover and while he was there, he became homesick and called his parents to come and get him. So naturally, the parents took him to a child psychologist to find out why he had "separation anxiety" -- at 7 years old! Of course, now looking back, his father is wondering if Owen someone had some "premonition" that he wouldn't be with his family for long. It's still a heartbreaking tale of loss and the people that are left behind.